I’ve carried on a tradition that my Mother began with her first grandchild, my oldest son. Each year at Christmas she would search for or make a Christmas tree ornament for each grandchild. If I remember correctly, McKenzie’s first ornament was an ‘Arizona Cactus’ purchased while preparing for Christmas in Phoenix AZ that year. In 2011, while in Osoyoos, BC prior to Christmas 2011, I spotted this tiny bear who was just crying out for clothes! 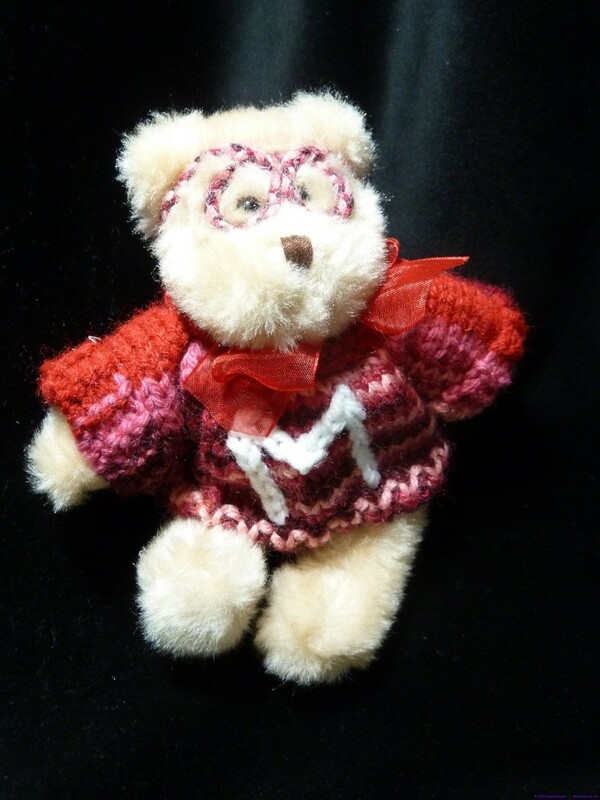 So I knit him a sweater with an ‘M’ for McKenzie and added a pair of glasses – for the gal that was newly sporting glasses that Christmas. Her first pair, candy coloured, didn’t survive long but they are memorialized on teddy!